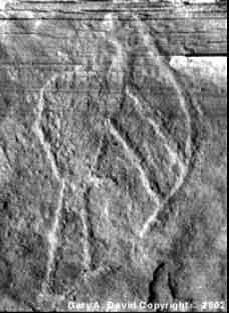 Do these rock drawings represent a race of Ant People? Do they actually record ancient encounters between humans and an alien species? Are the creatures truly “alien,” like those of the 1947 UFO crash near Roswell, New Mexico? Or are they some crypto-biological anomaly native to our planet? If not, then are they merely psychological manifestations--creations of the collective unconscious? Let’s examine the evidence. round like this but later became rectangular. 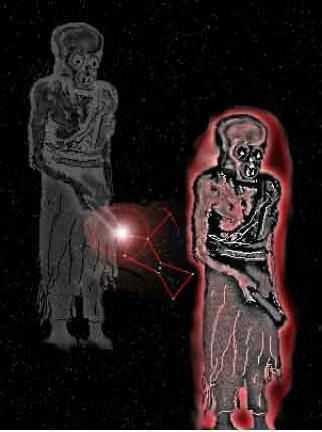 The Hopi god of death, the earth, and the Underworld is named Masau’u. Like the ants, he possesses knowledge of both the surface of the earth and the chthonic regions. He wears a mask with large open eye-holes and a large mouth. His huge, bald head resembles a summer squash, and his forehead bulges out in a ridge. His feet are long as a forearm, and his body is gray. This color is essential, since his name comes from the Hopi word maasi, meaning gray. In fact, this description from Hopi mythology is uncomfortably close to contemporary images of extraterrestrial Greys. 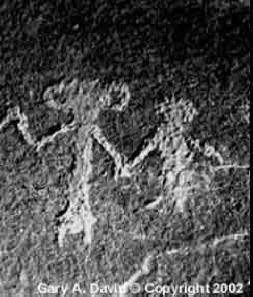 The Hopi word for ant is anu. In the same language naki means friend, prayer feathers, food offerings, or sand--a nexus of concepts pertaining to this insect that sometimes flies. A combination of the two words (anu-naki, or “ant friend”) may be related to Sitchin’s Anunnaki. The Babylonian sky god was also named Anu. One Sumerian cylinder seal from around 2250 B.C. shows the pantheon of primary deities wearing peaked hats. The Hopi sky god Sotuknang, closely associated with the earth god Masau’u, also wears a pointed headdress. Like their Middle Eastern counterparts, these American Indian divinities were present at the creation of the universe and continued to be instrumental in the culture’s development. Ants played a crucial role in the survival of the ancient Hopi. The Ant People’s great kiva provided sanctuary during both the destruction of the First World, or First Era, by fire (volcanism or asteroids) and the Second World by ice (glaciers). 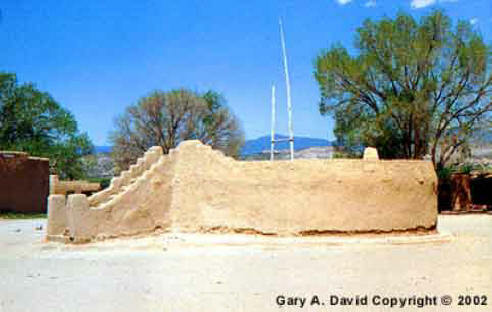 [For a possible location of this, see “Lost City of the Dead in the Grand Canyon” at Jack Andrews’ web site http://www.mysteriousarizona.com.] Only the virtuous members of the tribe following a certain cloud by day and a certain star by night were able to find the sky god Sotuknang. He elected to save these migrating “chosen people” by leading them to the Ant People for protection. 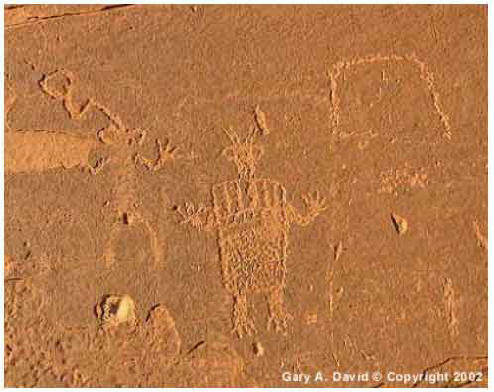 According to a rather brutal Hopi myth of “Why the Ants Are So Thin,” many ants were living east of Toko’navi, or Navaho Mountain near the Arizona/Utah border. These insects are described not in the allegorical manner of an Aesop fable but in an almost humanoid way. During a Kachina Society initiation, two ants had dressed up as fierce, giant Hu kachinas and flogged the ant children so hard that they were almost cut through in the middle of their bodies, hence their slenderness. Is this yet another reference to “giants in the earth”? Were the Ant People (nemâlâh) actually the progeny (called Nephilim) of women who mated with rebel angels? Did an emissary from Orion, whose name means ant, come to Arizona in order to become Masau’u, the ant-like god of the Hopi? Were the Ant People willing to save the virtuous humans from two different natural cataclysms because the former saw the genetic reflection of themselves in the latter? Were the kiva-like caves in which the Hopi found refuge really the anthills of ancient star beings? These questions may in the end be unanswerable. Nevertheless, the implications keep us intrigued. Gary A. David is an independent researcher and writer living in northern Arizona. The Orion Zone: Ancient Star Cities of the American Southwest is now available from Adventures Unlimited Press. This book discusses a correlation between the stars of Orion and the Hopi villages and ruins in the Four Corners region of the US. Recently Mr. David’s articles have appeared in Atlantis Rising, Fate, and World Explorer magazines. He is also a published poet.